Kogi state born politician and strong member of All Progressives Congress (APC), Prince Sanni Shuai’bu has bagged Sir Ahmadu Bello Sardauna Platinum Leadership Award in recognition of his quality leadership and humanitarian services to the good people of the state. 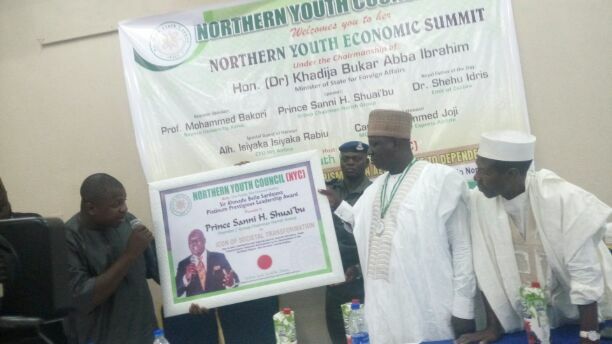 The award presentation, which was the highlight of Northern Youth Economic Summit, 2017 with people from all walks of life in attendance was organised and presented by Northern Youth Council (NYC) in Kaduna over the weekend to spur him to effect more lives positively in his quest for human development and wealth creation. Presenting the award at Asa Pyramid Hotel, Kaduna over the weekend, President, NYC, Isah Abubakar clarified that the award was given strictly on merit and not for sale as the council members have never meet the recipient one-on-one until the award day. He however urged him to see possible engagement with Nigerian youths especially in the area of ICT, agriculture and training. “This award is never for sale. We have identified you based on what we heard and see you doing in Kogi state. This award will only encourage you to do more of what you are doing to touch lives. We are proud of you for that and that is why we dim it fit to recognise your effort and that is what brought us here today”, added Isah. Receiving the award, Prince Sanni noted that, the northern elders were not doing enough to rescue the nation using the youths adding that, he will continue to engage relevant stakeholders in rebuilding the youths from the region to improve its social economic challenges. He took his time to encourage the youths to be productive no matter how small and never to allow themselves to be used by unscrupulous persons to cause mayem at any point in time warning that, those who do so will never use their children. On the award, Group Chairman of Garish Group thanked the organisers for recognizing and appreciating what he was doing promising to do more as long as he lives. He added that if he eventually become Kogi State governor, he will deliver quality developmental services to people of the state. Earlier, Speaker, NYC, Mohammed Salihu expressed worry over the degrees of challenges ravaging the north, calling on the leaders from the region to come to the aid of the region as the previous elders provided for them when they were youths. The summit according to the organisers was organised to bring youths and successful leaders from the region to brainstorming and see where they can come in to help the country of eminent hunger that may result from not engaging youths in doing farming in an attractive manner by a way of making modern farming equipment available to them at affordable cost among others.